It has been a little less than two weeks since the nostalgia bomb that was the series finale of the Samurai Jack revival, and if you are anything like me, you still haven’t emotionally recovered from seeing the beautiful resolution to a warrior’s path that started over 15 years ago. If you are even more like me, you might agree with my feeling that the final episode felt rushed, like an hour-long story stuffed into a 30-minute can. I didn’t have any objections to the plot—in fact, I loved it! It was simply another case in which I felt I needed more from the Bane of Aku. Which is exactly why I was so glad to get my hands on a copy of Samurai Jack: Tales of the Wandering Warrior. This graphic novel is a collection of the 20 Samurai Jack comics that were released between 2013 and 2015 as a way of continuing Jack’s story after it was abruptly cancelled after season 4, back in 2004. 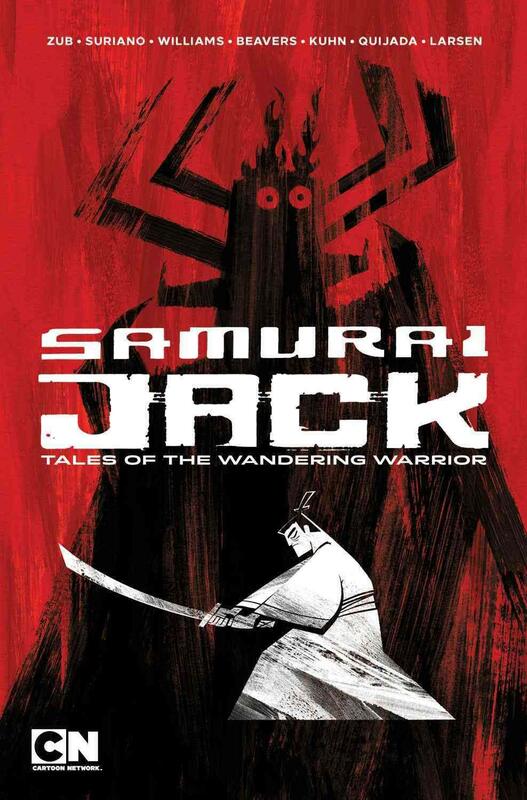 The tales in Tales of the Wandering Warrior tell more about Jack’s quest to get back home—starting with his search for an artifact that not even Aku knows about, which can take the warrior back in time and allow him to defeat the demon before his reign of evil takes root in the world. The book keeps its stride with the show, with each chapter taking the samurai to new lands and new people. What it does differently is making use of the graphic-novel medium to explore things that might not have been a fit for the TV show. The tones are darker, and topics are also directed at both adults and kids alike. If I didn’t know better, I might have thought the writer for the collection, Jim Zub, was the original writer for the series. The pacing, tone, and characters felt as though they had walked from the screen to the pages in my hands. I do, however, have a word of caution along with my praise for this collection: act fast, and be patient if you plan to buy it. When I had heard about the fifth season’s release date at the beginning of this year, I decided to prep myself and buy the compendium, which came out last October. After a brief search online, I was stunned—people were selling it for over $2,000! After more searching, I concluded that the hype for the final season was responsible for individual price hikes. I did find a copy through Amazon for about $30, so I immediately ordered it, but even with two-day shipping, it wasn’t scheduled to arrive for a month. And when that month passed, it was postponed for another month. And when May came, my order was postponed indefinitely. After speaking with Amazon, they told me that they had no idea when they would be able to send a copy to me, since they were sold out and did not know when they would be resupplied. I decided enough was enough and ordered it through IDW Publishing directly. I wound up paying a bit more for it after shipping was added, but I finally received my copy of the tales. This book is more than just a collection of stories about a cartoon I loved as a kid. It is a trophy of my youth, something that I will hold dear for years to come and a testament to the story of a lone fighter, a bastion of light in a world of darkness. A proud reminder of how the path of the righteous is nearly assured to be treacherous, but the reward of making the world a better place is assuredly worth it. Call me a romantic, but to be able to keep a tangible piece of that legacy is well worth the purchase price, and the few inches on my shelf. If you followed the Wandering Warrior with me, I promise you this book will hold a just as dear of a place with you as it does for me. This collection is currently out of stock on the IDW website and available in digital format only on Amazon, but check your local comic shop.